Benet and the Reform Movement. Talmudist and chief rabbi of Moravia; born in 1753 at Csurgό, a small vil lage in the county of Stuhlweissenburg, Hungary; died at Carlsbad Aug. 12, 1829. As Benet's parents were very poor and consequently unable to engage a teacher, they sent their son when only five years old to his grandmother at Nikolsburg. There Gabriel Markbreiter provided for the tuition of the gifted child for a period of six years, and then sent him to Ittingen, Alsace, the rabbi of which place was Markbreiter's brother-in-law. The latter became Benet's teacher, and took great delight in his pupil's wonderful development. At Benet's "bar miẓwah" (religious majority) celebration his teacher showed the guests, to their great astonishment, three of the boy's manuscripts—a commentary on the Pentateuch, a commentary on the Passover Haggadah, and novellæ on the Talmud. From his thirteenth to his fifteenth year Benet devoted himself exclusively to the study of the Bible, with the aid of the Jewish commentaries and of the Haggadah in Talmud and Midrash; and his strictly halakic studies he completed later in the yeshibah of Joseph Steinhard at Fürth, where he remained three years. He then went as a "ḥaber" to Prague, where Meïr Karpeles started a private "klaus" for him; and though Ezekiel Landau conducted a large yeshibah in the same city, a number of able Talmudists came daily to hear Benet's discourses. After staying at Prague two years he married Sarah Finkel (died 1828), the daughter of a prominent well-to-do citizen of Nikolsburg. Here he settled in 1773, and within a year was made "ab bet din" (ecclesiastical assessor). Thirteen years later he accepted the rabbinate at Lundenburg in Moravia, which he held for six months, when he resigned to become rabbi at Schossberg, Hungary. His stay in his native country was short; and in 1789 he was made rabbi of Nikolsburg and chief rabbi of Moravia. Later on he received offers also from Presburg and Cracow, but yielding to the solicitations of his congregation, he remained at Nikolsburg. Overstudy, however, had brought on a nervous affection in his youth, which clung to him throughout life, and was the cause of his death, which, as stated, took place at Carlsbad, whither he had gone for treatment. His body was buried temporarily at Lichtenstadt, near Carlsbad, but seven months later was permanently interred at Nikolsburg in accordance with his will. 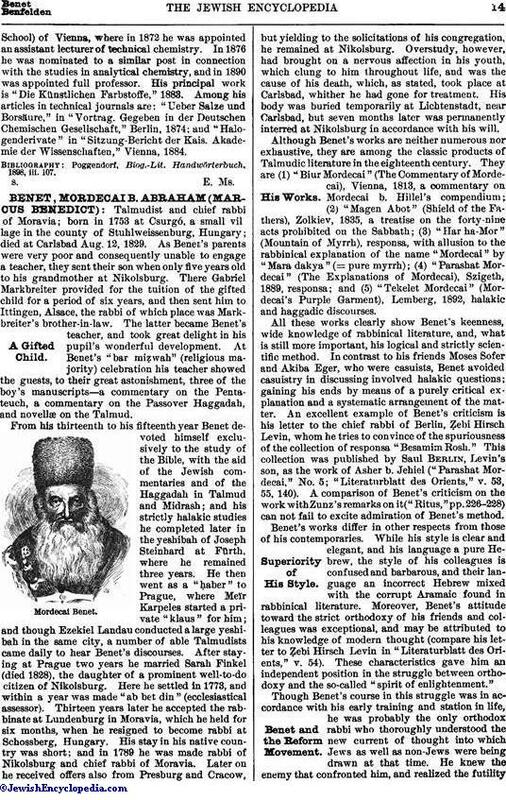 Although Benet's works are neither numerous nor exhaustive, they are among the classic products of Talmudic literature in the eighteenth century. They are (1) "Biur Mordecai" (The Commentary of Mordecai), Vienna, 1813, a commentary on Mordecai b. Hillel's compendium; (2) "Magen Abot" (Shield of the Fathers), Zolkiev, 1835, a treatise on the forty-nine acts prohibited on the Sabbath; (3) "Har ha-Mor" (Mountain of Myrrh), responsa, with allusion to the rabbinical explanation of the name "Mordecai" by "Mara dakya" (= pure myrrh); (4) "Parashat Mordecai" (The Explanations of Mordecai), Szigeth, 1889, responsa; and (5) "Tekelet Mordecai" (Mordecai's Purple Garment), Lemberg, 1892, halakic and haggadic discourses. All these works clearly show Benet's keenness, wide knowledge of rabbinical literature, and, what is still more important, his logical and strictly scientific method. In contrast to his friends Moses Sofer and Akiba Eger, who were casuists, Benet avoided casuistry in discussing involved halakic questions; gaining his ends by means of a purely critical explanation and a systematic arrangement of the matter. An excellent example of Benet's criticism is his letter to the chief rabbi of Berlin, Ẓebi Hirsch Levin, whom he tries to convince of the spuriousness of the collection of responsa "Besamim Rosh." This collection was published by Saul Berlin, Levin's son, as the work of Asher b. Jehiel ("Parashat Mordecai," No. 5; "Literaturblatt des Orients," v. 53, 55, 140). A comparison of Benet's criticism on the work with Zunz's remarks on it("Ritus," pp. 226-228) can not fail to excite admiration of Benet's method. Benet's works differ in other respects from those of his contemporaries. While his style is clear and elegant, and his language a pure Hebrew, the style of his colleagues is confused and barbarous, and their language an incorrect Hebrew mixed with the corrupt Aramaic found in rabbinical literature. Moreover, Benet's attitude toward the strict orthodoxy of his friends and colleagues was exceptional, and may be attributed to his knowledge of modern thought (compare his letter to Ẓebi Hirsch Levin in "Literaturblatt des Orients," v. 54). These characteristics gave him an independent position in the struggle between orthodoxy and the so-called "spirit of enlightenment." Though Benet's course in this struggle was in accordance with his early training and station in life, he was probably the only orthodox rabbi who thoroughly understood the new current of thought into which Jews as well as non-Jews were being drawn at that time. He knew the enemy that confronted him, and realized the futilityof employing for defense the rusty weapons of the Talmud. It is true, he avoided the name of Mendelssohn in his approbation (dated Nov. 8, 1816) to the new edition of the Pentateuch with Mendelssohn's translation; but the very fact that he approved a German translation of the Bible at all shows that he ought not to be classed with men like Moses Sofer. He opposed the attempted reforms of Aaron Chorin; but he did it quietly and temperately, contenting himself with the remark that something more than philosophical study is required to decide theological questions. Frequently Benet showed an insight lacking in his opponents. In his memorial to the government on the education of rabbis (printed in "Toledot Mordecai," pp. 35-37), he remarked that if the course of studies which the gymnasium demanded of candidates for all other professions were required of a rabbinical candidate, the latter would be fit for anything except the rabbinate. Still, far from objecting to a secular education for rabbis, as he was understood to do (see Löw, "Gesammelte Schriften," ii. 190 et seq. ), he favored it; but he thought that a rabbi should first of all possess sufficient knowledge of rabbinical matters; and he proposed that a rabbinical candidate should devote his time chiefly to Jewish subjects until his eighteenth year. His opinions concerning the duties of a rabbi, especially in regard to the instruction of children, show the strong influence that modern views had upon him. He wrote a catechism for religious instruction and submitted it in manuscript to the government. To judge from the letter accompanying it, Benet's views on the education of the young were sensible and in accordance with the spirit of the time. Nevertheless, Benet, conscientiously opposing the new tendency, declared every reform in religious observance to be wrong and harmful. Thus, in a letter to the government concerning the introduction of German into divine service (ib. pp. 38-42), he wrote in favor of the preservation of Hebrew. 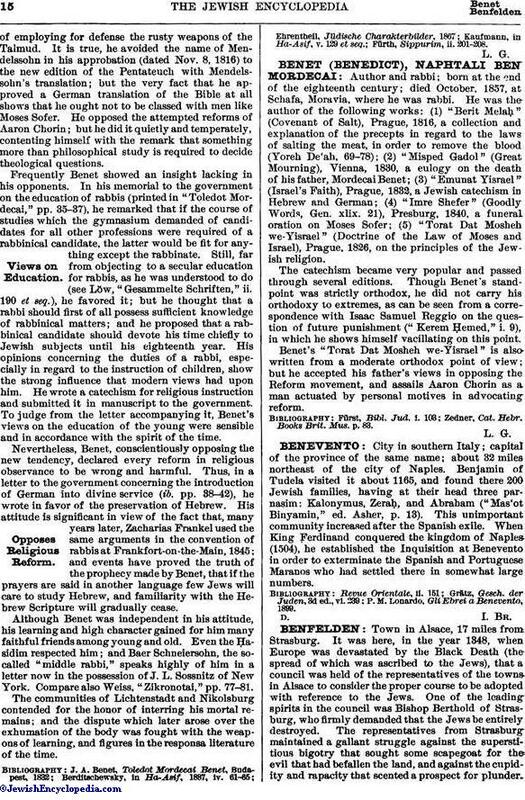 His attitude is significant in view of the fact that, many years later, Zacharias Frankel used the same arguments in the convention of rabbis at Frankfort-on-the-Main, 1845; and events have proved the truth of the prophecy made by Benet, that if the prayers are said in another language few Jews will care to study Hebrew, and familiarity with the Hebrew Scripture will gradually cease. Although Benet was independent in his attitude, his learning and high character gained for him many faithful friends among young and old. Even the Ḥasidim respected him; and Baer Schneiersohn, the so-called "middle rabbi," speaks highly of him in a letter now in the possession of J. L. Sossnitz of New York. Compare also Weiss, "Zikronotai," pp. 77-81. The communities of Lichtenstadt and Nikolsburg contended for the honor of interring his mortal remains; and the dispute which later arose over the exhumation of the body was fought with the weapons of learning, and figures in the responsa literature of the time.